This is where you want to be, if you're trying to design your way into a richly colored and decorated high end dining room space without the help of a design professional. Here, we outline the best online furniture sources for pictures and illustrations to help inspire your next design idea. In each of the following links, you'll be tempted to click away to different pages. Don't do it. You'll likely just waste time and get lost in mazes of non-related content. We have spent hours scouring each of these resources to make the best viewing experience possible for your time. Each of the following links will open a new browser window, so you can always close the page and come back to this page. Try to imagine each of the following links as new tool. Please read the caption after the link to learn what the tool does. The caption is key to making this page work for you. 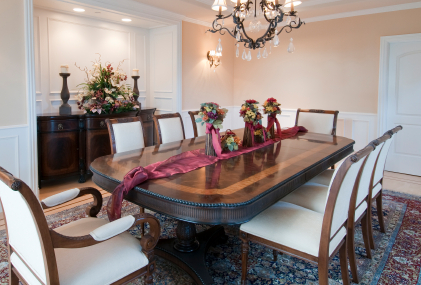 If you have a good source for traditional formal dining room pictures, let us know so we can post them here. #1 "Starting Point" AntiquePurveyor's blog, "Periods and Styles". These posts will not only show you pictures in different historic styles of furniture, but also provides a link to help you find products that represent that period. Cool link if you want to see how traditional and formal periods are represented in todays market. Find Hepplewhite style furniture, Adams style furniture and related internal links to product lines. #2 MuseumFurniture I found this site, and thought you should know about it. Forget about buying anything you see on this site, most of it is in another country, has already sold or stands in a museum. Great site to browse all the styles in a alphabetic order. Nice eye candy. #3 Architectural Digest Dining Rooms Here is link or two that should inspire your next space. 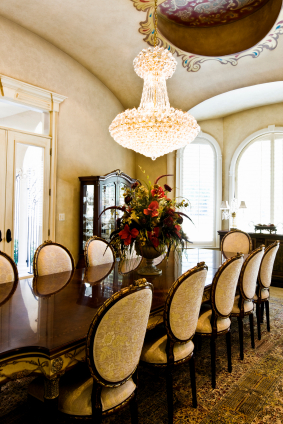 Find great pictures of formal traditional dining rooms. When this page opens, pick from the long list of estates and designers. And even though this link has searched out the site for traditional furniture, you'll still have to sort out some of the more modern furniture. Give this site some time and you'll be rewarded with great color and pattern ideas. #4 Testimonials Brief, but nonetheless helpful. Here, you can see some real life situations of our recent past. You might get some great ideas if you visit this link. A short list, but growing quickly. #5 Home and Garden This site would be great, if it wasn't full of pop ups. It is hard to navigate around this site unless you pay and register. Bah humbug, the Internet is about free stuff. I found a search term that will get this home and garden tool working for you. This link will take you to some cool pictures, you'll have to work at this site but it can be rewarding and is worth your time. #6 Google Images Search results in google images. #7 istock Photos Great site that antiquepurveyor manages for your enjoyment, link will take you to a generous handful of great ideas for your next designer dining room. 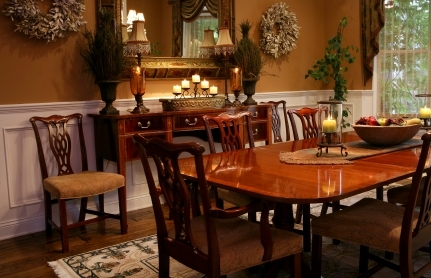 #8 HGTV A great link to more designs, specifically traditional designer dining rooms. Complements of HGTV. Just use top right corner scroll button to view about 70 more dining room ideas. #9 Pinterest Fantiastic collection of links organized on a Pinterest board with dining room ideas sorted by color. A must see for those in the design phase of a new dining room project. AntiquePurveyor's pinterest board can be viewed by anyone or followed if you open a pinterest account. #10 HGTV With filters. Greast place to search rooms by style or by color. Select filters on left margin of this page. #11 Houzz.com new designer website created by users. A must browse. #12 Furniture Style Guide A pretty good guide to period furniture.